A few days ago, I've recently been contacted by Godson Rapture from Cool Python codes to answer a few questions about what I work on in open source. Godson regularly interview developers and I invite you to check out his website! Here's a copy of my original interview. Enjoy! 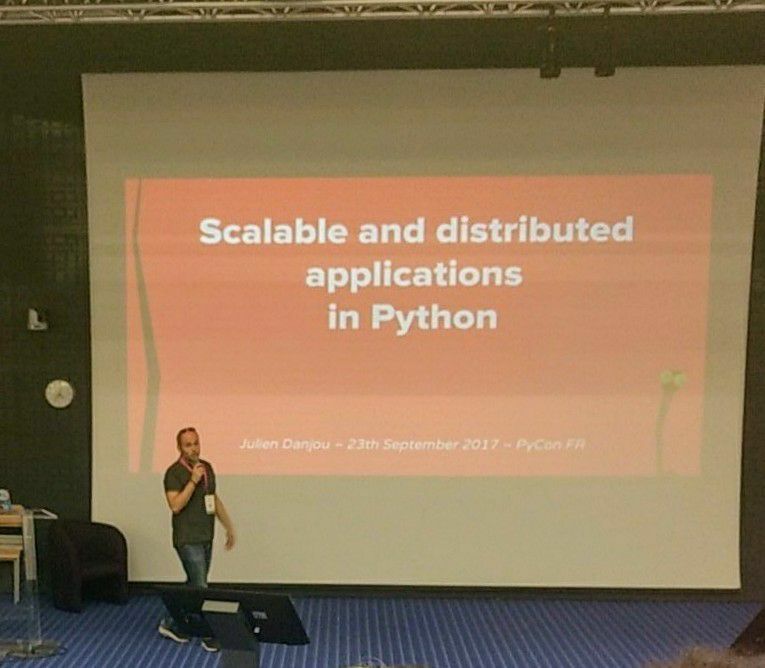 Good day, Julien Danjou, welcome to Cool Python Codes. Thanks for taking your precious time to be here. Could you kindly tell us about yourself like your full name, hobbies, nationality, education, and experience in programming? Sure. I’m Julien Danjou, I’m French and live in Paris, France. I studied Computer science for 5 years around 15 years ago, and continued my career in that field since then, specializing in open source projects. Those last years, I’ve been working as a software engineer at Red Hat. I’ve spent the last 10 years working with the Python programming language. Now I work on the Gnocchi project which is a time series database. When I’m not coding, I enjoy running half-marathon and playing FPS games. Can you narrate your first programming experience and what got you to start learning to program? I started programming around 2001, and my first serious programs were in Perl. I was contributing to a hosting platform for free software named VHFFS. It was a free software project itself, and I enjoyed being able to learn from other more experienced developers and being able to contribute back to it. That’s what got me stuck into that world of open source projects. Which programming language do you know and which is your favorite? I know quite a few, I’ve been doing serious programming in Perl, C, Lua, Common Lisp, Emacs Lisp and Python. Obviously, my favorite is Common Lisp, but I was never able to use it for any serious project, for various reasons. So I spend most of my time hacking with Python, which I really enjoy as it is close to Lisp, in some ways. I see it as a small subset of Lisp. What inspired you to venture into the world of programming and drove you to learn a handful of programming languages? It was mostly scratching my own itches when I started. Each time I saw something I wanted to do or a feature I wanted in an existing software, I learned what I needed to get going and get it working. I studied C and Lua while writing awesome- the window manager that I created 10 years ago and used for a while. I learned Emacs Lisp while writing extensions that I wanted to see in Emacs, etc. It’s the best way to start. When writing about Gnocchi, I usually try to explain what part of the project I worked on, what new features we achieved, etc. On Python, I try to share solutions to common problems I encountered or identified while doing e.g. code reviews. Or presenting a new library I created! Tell us more about your book, The Hacker’s Guide to Python. It’s a compilation of everything I learned those last years building large Python applications. I spent the last 6 years developing on a large code base with thousands of other developers. I’ve reviewed tons of code and identified the biggest issues, mistakes, and bad practice that developers tend to have. I decided to compile that in a guide, helping developers that played a bit with Python to learn the stages to get really productive with Python. OpenStack is the biggest open source project in Python, Can you tell us more about OpenStack? OpenStack is a cloud computing platform, started 7 years ago now. Its goal is to provide a programmatic platform to manage your infrastructure while being open source and avoiding vendor lock-in. Who uses OpenStack? Is it for programmers, website owners? It’s used by a lot of different organizations – not really by individuals. It’s a big piece of software. You can find it in some famous public cloud providers (Dreamhost, Rackspace…), and also as a private cloud in a lot of different organizations, from Bloomberg to eBay or the CERN in Switzerland, a big OpenStack user. Tons of telecom providers also leverages OpenStack for their own internal infrastructure. I’ve attended the last 9 OpenStack summits and a few other OpenStack events around the world. I’ve been engaged in the upstream community for the last 6 years now. My area of expertise is telemetry, the stack of software that is in charge of collecting and storing metrics from the various OpenStack components. This is what I regularly talk about during those events. How can one join the OpenStack community? There’s an entire documentation about that, called the Developer’s Guide. It explains how to setup your environment to send patches, how to join the community using the mailing-lists or IRC. What makes your book, The Hacker’s Guide to Python stand out from other Python books? Also, who exactly did you write this book for? I wrote the book that I always wanted to read about Python, but never found. It’s not a book for people that want to learn Python from scratch. It’s a great guide for those who know the language but don’t know the details that experienced developers know and that make the difference. The best practice, the elegant solutions to common problems, etc. That’s why it also includes interviews with prominent Python developers, so they can share their advice on different areas. How can someone get your book? I’ve decided to self-publish my book, so he does not have an editor like you can be used to see. The best place to get it is online at where you can pick the format you want, electronic or paper. What do you mean when you say you hack with Python? Unfortunately, most people refer to hacking as the activity of some bad guys trying to get access to whatever they’re not supposed to see. In the book title, I mean “hacking” as the elegant way of writing code and making things worse smoothly even when you were not expecting to make it. You mentioned earlier that Gnocchi is a time series database. Can you please be more elaborate about Gnocchi? Is there also any documentation about Gnocchi? So Gnocchi is a project I started a few years ago to store time series at large scale. Timeseries are basically a series of tuple composed of a timestamp and a value. Imagine you wanted to store the temperature of all the rooms of the world at any point of time. You’d need a dedicated database for that with the right data structure. This is what Gnocchi does: it provides this data structure storage at very, very large scale. The primary use case is infrastructure monitoring, so most people use it to store tons of metrics about their hardware, software, etc. It’s fully documented on its website. How can a programmer without much experience contribute to open source projects? The best way to start is to try to fix something that irritates you in some way. It might be a bug, it might be a missing feature. Start small. Don’t try big things first or you could be discouraged. Also, don’t plunge right away in the community and start poking random people or spam them with questions. Do your homework, and listen to the community for a while to get a sense of how things are going. That can be joining IRC and lurking or following the mailing lists for example. Big open source communities dedicate programs to help you become engaged. It might be worth a try. Generic programs like Outreachy or Google Summer of Code are a great way to start if you don’t feel confident enough to jump by your own means in a community. Just out of curiosity, do you write code in French? Never ever. I think it’s acceptable to write in your language if you are sure that your code will never be open sourced and that your whole team is talking in that language, no matter what – but it’s a ballsy assumption, clearly. Truth is that if you do open source, English is the standard, so go with it. Be sad if you want, but please be pragmatic. I’ve seen projects being open sourced by companies where all the code source comments were in Korean. It was impossible for any non-Korean people to get a glance of what the code and the project was doing, so it just failed and disappeared. How does a team of programmers handle bugs in a large open source project? I wish there was some magic recipe, but I don’t think it’s the case. What you want is to have a place where your users can feel safe reporting bugs. Include a template so they don’t forget any details: how to reproduce the bugs, what they expected, etc. The worst thing is to have users reporting “That does not work.” with no details. It’s a waste of time. What tool to use to log all of that really depends on the team size and culture. Once that works, the actual fixing of bug doesn’t follow any rule. Most developers fix the bug they encounter or the ones that are the most critical for users. Smaller problems might not be fixed for a long time. That new book is entitled “Scaling Python” and it provides insight into how to build largely scalable and distributed applications using Python. It is also based on my experience in building this kind of software during the past years. This book also includes interviews of great Python hackers who work on scalable system or know a thing or two about writing applications for performance – an important point to have scalable applications. The book is in its final stage now, and it should be out at the beginning of 2018. I’m reachable at julien@danjou.info by email or via Twitter, @juldanjou.